Stocks fell on Tuesday as corporate results from Caterpillar and 3M disappointed investors, but managed to recover most of their losses as McDonald’s and defensive stocks like Procter & Gamble all rose. Dow Jones Industrial Average dropped 102 points while the S&P 500 declined 0.5 percent. The Nasdaq Composite fell 0.4 percent. The small-caps Russell 2000 dropped 0.5 percent and turned negative for the year. At its session lows, the Dow had fallen 548.62 points, while the S&P 500 and Nasdaq had lost more than 2 percent each. The comeback was led by McDonald’s, which rose more than 6 percent on strong earnings, and a half a percent gain in Procter & Gamble. 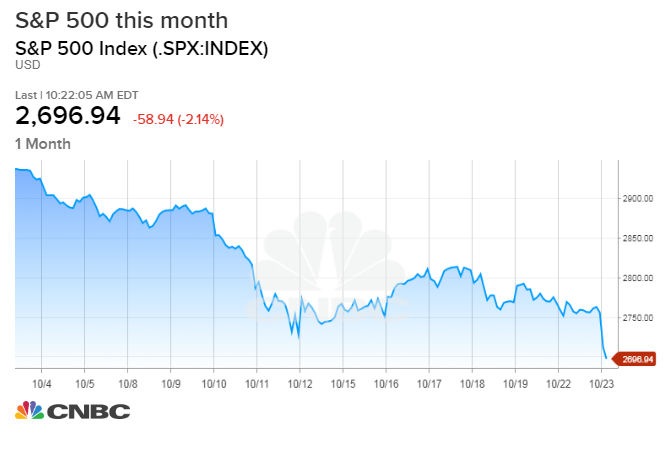 The S&P 500 was on pace for its fifth straight decline and briefly dipped below the lows hit earlier this month during this ongoing sell-off. The major indexes are all down at least 5.9 percent for October. Caterpillar dropped 6.6 percent following the release of its results. The company said its manufacturing costs rose due to higher material and freight costs. Material costs were driven by higher steel prices and tariffs. This drop adds to Caterpillar’s steep monthly losses. Through Monday’s close, the stock is down 15.6 percent for the month.